When I was reviewing my handmade PJ's situation a few weeks ago, I must say, it wasn't very encouraging. One pair that I made last year is still in circulation, but the other pair has been sent off for textile recycling, tragically pimpled beyond belief. Just as I was gearing myself up to think about making a new pair, Karen announced her PJ sewalong. Hoorah, just the boot up the arse I needed. I bought the pattern - Sewaholic Tofino - chose the fabric, sewed them up..... And? They're a fine, classy pair of PJ bottoms, that's what. Size wise, I started with a Sewaholic size 10 waist, tapering down to a size 6 at the hips. My waist is actually a size 8 but I didn't want these trousers to be tight - they're designed for lounging after all. And my style of lounging doesn't involve any holding in of the stomach. At all. By shortening the leg length by about four inches, I was also able to squeeze these out of two metres of fabric rather than the three yards the pattern advises - yes! The fabric I used is a lovely, duck-egg coloured quilting cotton which has a nice, crisp medium weight, perfect for PJ bottoms. I nabbed it at a blogger meet up in Walthamstow a couple of months ago, courtesy of Tilly - thanks Tilly! The pattern instructions are perfectly clear, but for this make, I didn't bother with the instructions, preferring to see each step explained in glorious technicolour by Karen as part of the sewalong. If you're new to sewing and fancy an easy beginner project, then you should really have a look at her PJ sewalong posts - they're a great resource. Never mind eh?! Even though they make me look like Sporty Spice, they fill a gap in my PJ wardrobe and are infinitely classier looking than my other pairs. So instead of jumping on my bed today, I thought I'd lounge around in my boudoir, feeling classy. Welcome everyone - and in a final effort to crank up the raciness factor of this post, you'll see I'm reading Mr Alan Bennett in bed. Grrr!! Recently I saw this picture of Betty Draper wearing a floral print sleeveless blouse and knew immediately I had to make it. As well as being a ridiculously pretty blouse, I happened to have the perfect fabric AND the perfect pattern in my stash. And you don't have to be a rocket scientist to guess which pattern I had in mind - yup, vintage Simplicity 4238. This is my third version of this blouse (other versions here and here), but it's a great shape and a great fit - so why not?! Back to the blouse....The fabric is a Liberty print cotton from one of the goody bags kindly supplied by Minerva Crafts at the epic blogger meet up in April. I'd initially received a set of crochet hooks in my goody bag and after bemoaning the fact that I don't crochet to Sally from Charity Shop Chic, she very kindly offered to swap bags. Just another instance of how awesome sewing bloggers are. If I'd received Liberty fabric in my goody bag, you'd have had to prise it from my fingers, but no, she happily handed it over without a murmur. Thank you SSOO much Sally! 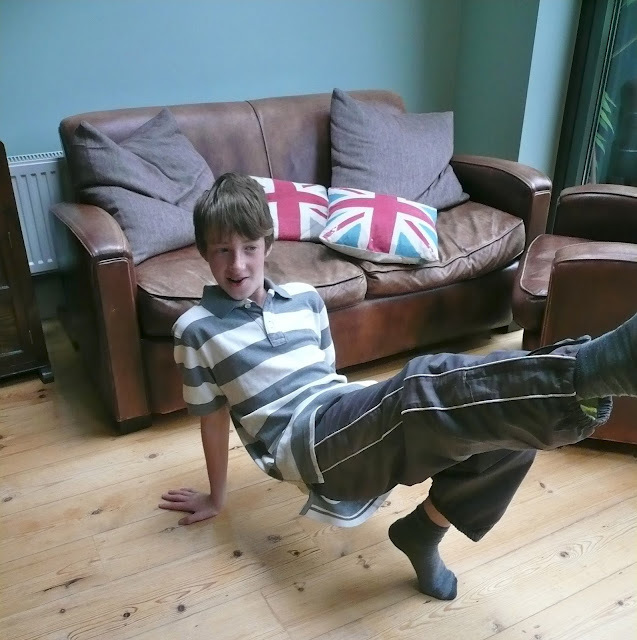 There was only a metre of fabric, but that's the great thing about his pattern - a metre is all that's required. As soon as I saw the Betty picture, I knew immediately that I would use the goody bag fabric to recreate it. My fabric has a bit more red and blue in it and perhaps not as much green and yellow, but it's a pretty good match. The vintage pearly buttons were gifted to me by another blogger and I'm ashamed to say I can't remember who. If you recognise them as precious buttons you gave to an ungrateful wretch named Jane, then please let me know and I'll give you the credit you so rightfully deserve! I used vintage pink bias binding for the insides of the sleeves which gives the blouse a wonderfully girly finish. And talking of girly, look what was printed on the wrapper? You're invited to write in for trims and scraps to make dolls clothes with! Aw! Although I made exactly the same size, this blouse is a looser fit than my last version, as the stretch cotton I used last time really yanked you into position. It's still a good, fitted shape overall though, thanks to the trillions of darts. I haven't tried it tucked in but I suspect it passes the test, how can you go wrong with such lovely fabric? Vintage 1970's patterns - a fitted blouse and a shirt dress. Vintage buttons and trim. I like the unusual colour of those coat buttons. And the piece de resistance - vintage Habitat fabric featuring birds and cherries! I'll have to think very carefully about what I make with this as it's so, so lovely. My friend Emma would have plenty of ideas but she's not having it, it's MINE. The fabric is more of a decor weight so I'm thinking along the lines of a very special bag. AND, because Denise is so lovely, she also sent me one of her handmade notebook covers that she sells at craft fairs. Red polka dots? Yes please. I've been pondering whether to make a few of these for my xmas craft fairs, so it was really good to see one up close. They look easy peasy to make too - find out how in Dottie Doodle's tutorial here. 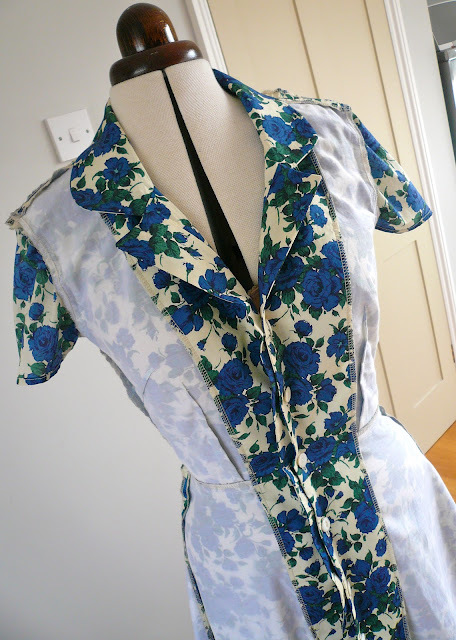 I gave my Blue rose shirt dress its first official outing on Friday when I hosted a Vintage Tea Party at home. Remember my friend Lucy who I made a Cake Bag for earlier in the year? Well, she also runs a Vintage Tea Party service, where she brings beautiful vintage crockery to your home and supplies you with a never-ending stash of DELICIOUS home baked cakes and sandwiches. So if you have a hankering to pretend you're in a Merchant Ivory film or, like me, just want an excuse to get a few friends together for a chat and to stuff your faces with cake, then I can highly recommend it. She only currently offers the service in West London, but I just wanted to mention it here because we had such a wonderful day. It was a really lovely way to catch up with seven of my bestest friends and it gave me a perfect excuse to wear a flowery dress. Plus the cakes were absolutely mouth watering. The washing machine spoils the vintage picture somewhat, but never mind...! Right at the final stage of making my Juniper trousers a few weeks ago, a funny old sewing tip came magically to my rescue. I had occasion to use this tip again yesterday, which reminded me to share it.... As I was sewing the last cream button onto the waistband, I suddenly noticed that the button and thread were turning pink. I'd only gone and pricked my finger on the needle and was bleeding all over the button and thread. Doh! I used two metres of bright red fabric, red thread, even red interfacing, but I had to go and bleed on the one tiny non-red area of my trousers. What are the chances?! Now I know what you're thinking, it wasn't an absolute disaster. The button was plastic and could wipe clean and I could have easily removed the now pink thread and re-sewn the button on. But it was the very last stage, almost the last stitch on my make and I was desperate to get them on and photographed whilst the sun was out. 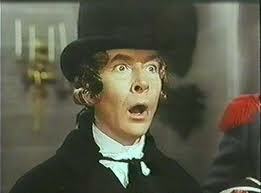 So without even stopping to think what I was doing, I found myself repeatedly spitting on the button thread. Oh my god!!! Apologies if you're easily offended, but that's what I did folks. I was putting into practice a sewing tip I'd read on a sewing blog yonks ago and filed away in my subconscious waiting for just the right moment. Apparently it has to be your own er spit (sorry), something to do with the enzymes in the saliva breaking down the proteins in the blood. Anyway, I'm delighted to report it worked like magic - it was pretty amazing seeing the thread turning colour from pink back to white right before my very eyes!! I discovered this tip on Sherry's blog - Pattern, Scissors, Cloth*. Apparently, a more experienced seamstress colleague taught her the trick when she worked in the garment industry and she's been good enough to pass it on in turn. And despite the grossness, this sewing tip actually worked like a dream for me. Have you ever found yourself automatically putting into practice a weirdo sewing tip you've read about and stored in your brain? And did it work?? I'd love to know! * As an aside, does anybody know what the story is with Sherry and her blog? She suddenly stopped blogging last summer and I for one have missed her dearly. 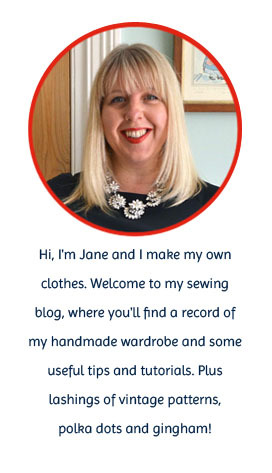 Her blog was one of my favourites, absolutely packed to the gills with wonderful tips and tutorials as well as her own beautifully stitched wardrobe. Whatever the reason for the blog break, I hope you're well and happy Sherry, we miss you! 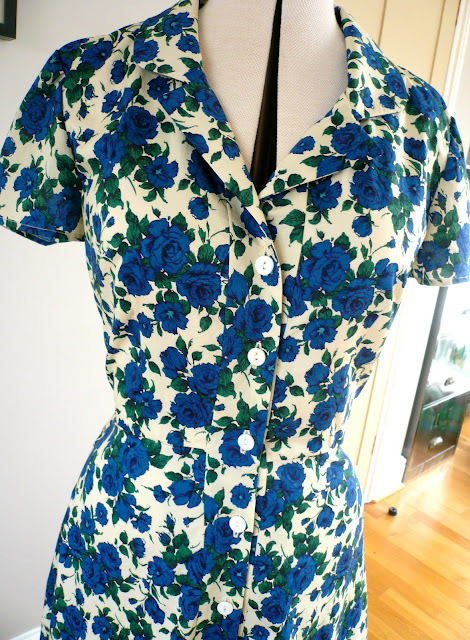 My big news for today is that my blue rose shirt dress is finished. Hoorah! A few stumbling blocks were flung across my path during the making of it, including half term holidays and a serious buttonhole foot malfunction. But now it's finally completed, I'm glad I made it at my own pace and didn't try to rush the making of this lovely dress. This is the second time I've used McCall's 4769 (the first being my Jubilee dress), so I knew I didn't need to make any further adjustments to the pattern. In fact I didn't have to make any the first time round, just shortening the skirt using the petite lines on the pattern. For fabric I used my all time favourite Liberty print - Carline - which is a fab blue rose print on a cream background. It was a tight squeeze cutting out all the pattern pieces as I only had two metres, but omitting the pockets and sleeve bands seemed to just about swing it. It's fully underlined with silk cotton (apart from the sleeves), which makes a massive difference both in opacity and feel. The blue of the roses really pops with the white underlining and the dress now has a luxurious weightiness to it that I love. 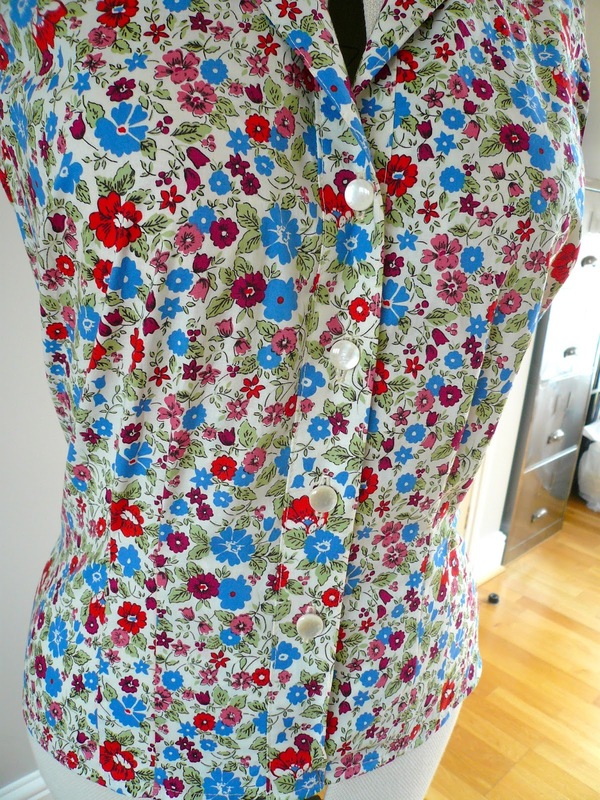 My first version of this dress only has six buttons and buttonholes, and with hindsight, I think a couple of extra ones wouldn't have gone amiss. So this time round I made eight buttonholes, which gives the dress that extra bit of security! And finally, I managed to use the last scraps of my Watch this Lace trimming on the hem. It's a perfect colour match too - don't you just love it when that happens?! Can my cheeks possibly look any more hamster like? 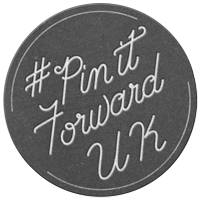 For the past month or so, Pinterest has been running its Pin It Forward campaign to help spread the word about its official UK launch. Small armies of bloggers have been waxing lyrical about what it is they like about Pinterest, and today it's my turn. The idea behind Pinterest is that you can collect (or 'pin') images and pictures you find online onto a virtual pin board. You can then organise your images onto different subject boards and refer back to them whenever you want. It's as simple as that. It works brilliantly for me because I work much better with visual references, but I do have to ration myself severely, otherwise I'd be on there all day. And I mean literally. All. Day. I don't actually have a pin board at home, which is a shame because I'd love to be able to see and be inspired by pictures of lovely things whilst I work. But the good news is that I can really make Pinterest work for me as a reference tool. I can pin the images I like and order them by theme - as many as I like too as there's no limit to the number of pins or boards you want to create! The other big advantage is that you can follow other people, check out what they've pinned to their boards and repin any images that take your fancy. I love discovering new boards and pinners, especially if they have a taste for the same kinds of things as me. And that's exactly why it's so addictive! It's a fabulous resource for dressmakers. One of my favourite boards is my Sewing Inspiration board. Or by pattern. I have a polka dots board...and a gingham one... and a stripes one. And one of handsome men …. Sometimes just scrolling through my boards will give me the inspiration I need for a certain project. Remember my lace trimmed collar and placket for Marie's Watch this Lace project? 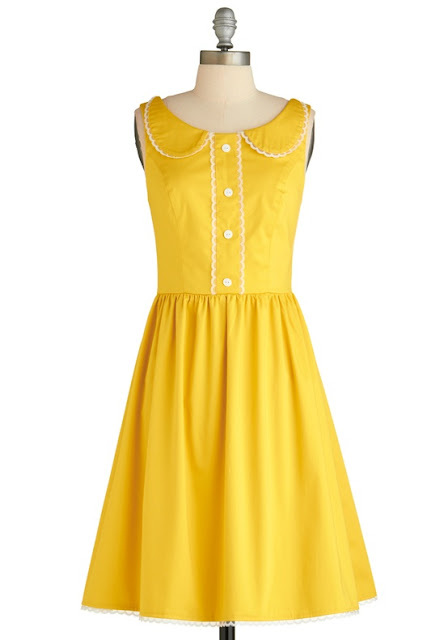 That was totally inspired by this dress I'd pinned to my yellow board. And my Sew for Victory dress? The pattern was one I'd pinned to my patterns board and was able to track down. I think I can safely say I'm a fan! If you haven't joined Pinterest already, you can do so here. The next blogger in the campaign who will be spreading the Pinterest love is Kim Dellow. She'll be sharing her blog post tomorrow and you can find her Pinterest boards here.